← What Makes a Music Journalist Good? SKF NOTE: This is another in my series of Modern Drummer backgrounder interviews. 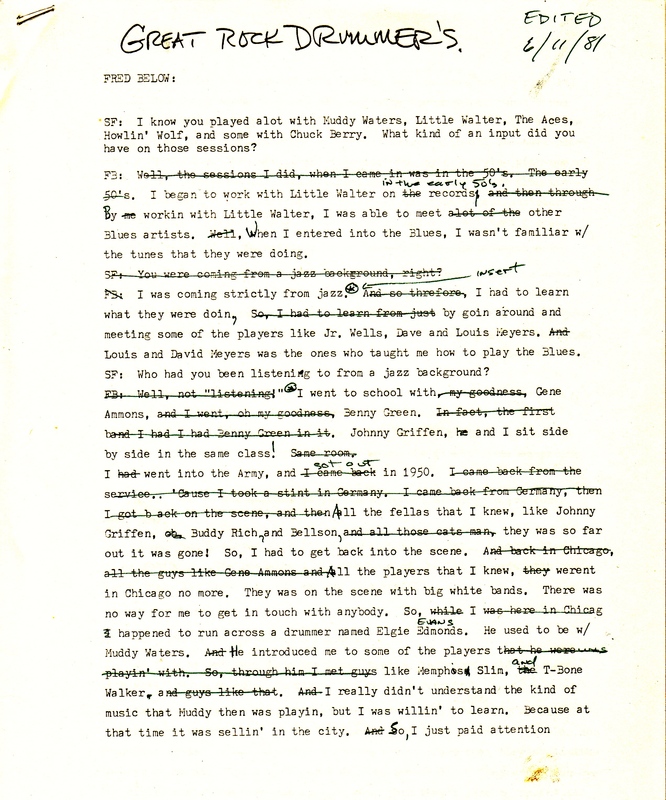 I wrote on the transcript that I edited this interview on June 11, 1981 for use in the Blues Drummers segment of my History of Rock Drumming. The interview itself took place around that time, perhaps as soon as the day before I transcribed it. This is the full transcript, published here for the first time. You can see from the first page alone, shown at the end of this post, how heavily edited was this backgrounder interview. For me, this was an exciting interview for a couple of reasons. Fred Below had been an inspiration to me for many years. And it was surprising, because it was not stereotypical of blues drummers, to hear Fred Below outline his musical background and his influence in shaping the forms, the phrasing of Chicago blues. That is, Mr. Below was key in moving blues players from “haphazard” odd number phrasing to the standard blues phrasing of 8 bars, 12 bars and so forth. Scott K Fish: I know you played a lot with Muddy Waters, Little Walter, The Aces, Howlin’ Wolf, and some with Chuck Berry. What kind of an input did you have on thos sessions? Fred Below: Well, the sessions I did when I came in was in the ’50s. The early ’50s. I began to work with Little Walter on the records, and then, through…. by me working with Little Walter I was able to meet a lot of the other blues artists. Well, when I entered into the blues I wasn’t familiar with the tunes that they were doing. SKF: You were coming from a jazz background, right? FB: I was coming strictly from jazz. And so therefore, I had to learn what they were doing. So, I had to learn from just by going around and meeting some of the players like Junior Wells, Dave and Louis Meyers. And Louis and David Meyers was the ones who taught me how to play the blues. SKF: Who had you been listening to from a jazz background? FB: Well, not listening. I went to school with, my goodness, Gene Ammons. And I went – oh, my goodness – Bennie Green. In fact, the first band I had I had Bennie Green in it. Johnny Griffin. He and I set side-by-side in the came class. Same room. I had went into the Army and I came back in 1950. I came back from the service, because I took a stint in Germany. I came back from Germany. Then I got back on the scene and then all the fellows that I knew – like Johnny Griffin, oh, Buddy Rich and Louis Bellson, and all those cats. Man, they was so far out it was gone! So, I had to get back in to the scene. And back in Chicago, all the guys like Gene Ammons and all the players that I knew — they weren’t in Chicago no more. They was on the scene with big white bands. There was no way for me to get in touch with anybody. So, while I was here in Chicago I happened to run across a drummer named Elgin Evans. He use to be with Muddy Waters. And he introduced me to some of the players that he were playing with. So, through him I met guys like Memphis Slim, and T-Bone Walker, and guys like that. And I really didn’t understand the kind of music that Muddy was playing, but I was willing to learn, because at that time it was selling in the city. And, so I just paid attention to the guys that I was around and learned it. Learned how to play it. But, I had to put some to it myself. And somehow or other, what I was doing, I established my way of playing it and it caught on with all the other blues guys. So my style was very familiar with all the harp players. They all wanted ones to get into it. So by me playing with one of the best – which was Little Walter – that set me a little apart from the rest. Because I had established a style that was from a jazz musician interpreting the blues in a different way. And I established a beat. SKF: Did you find it frustrating to go from jazz to blues sometimes? FB: No. I found it very illuminating because, you see, I went to school to learn and finish music. I’ve been through the Roy C. Knapp School. And I met some of the greatest drummers in the world there. Buddy Rich, I met him. I met [Louis] Bellson. I met Gene Krupa and all of the guys, all of the big guys, because we use to go downtown to the Chicago Theater when they came to town and see them. What made blues fascinating with me was because it was a type of music that I wan’t familiar with — and they didn’t teach it in school! And I don’t think they do it now. So, it’s an altogether different style. So, I had to play it in a way that it would make sense to me. What I did was worth the finest finished product right now. SKF: Yeah. You’ve got a great style. I’ve been listening to you for a long time. FB: Yeah. So I played with Dinah Washington, Big Bill [Broonzy], Memphis Slim – oh, my goodness – The Moonglows. I made some of the hit records with The Moonglows. You know a record called Sincerely? SKF: Well, when you went into the Chess Studios to record, did the band know what they were going to record before they went in? FB: Depend on who you went with. When I went in with Little Walter we always rehearsed our stuff. Then we got it down. Like, with other people — no. They just called me and say that they had a session, and that they would like to have me on it. And I would come down to the studio. They would run over the stuff. And after they got it down pat, then they would send me in, and I’d listen to what they were doing. Then they’d tell me, “Say, can you put something with this?” And that’s the way it were. SKF: But, with The Aces — that was with you and the Meyers brothers? FB: No, no, no. That’s altogether different. See, The Aces, it started out with Little Walter. But then Dave and Louis [Meyers] left. And that left me by myself with Walter. And then they had Robert Jr. Lockwood and then Luther Tucker. SKF: And that was the band that was called The Aces? You four? FB: No. The first band was called Jukes – which had The Aces in it, which was Dave and Louis Meyers. Then we regrouped later on in the early ’70s and we went to Europe. SKF: Were you able to use your own drums on those recording sessions? FB: Oh, I always use my own drums. I don’t play on nobody else’s drums. I made it a point. You know, I’m a jazz drummer and I like sound. And I like to tune my own drums. I don’t like to play on no one elses drums. I know how mine’s going to sound when I touch them. See, I tune my drums. This is a main thing about any drummer. That is, if you call yourself a drummer. You should know something about your instrument. So this is what I know how to do — is to tune. I learned that from going to school. I didn’t spend all that time going to school and not paying attention to what they was telling me. Irregardless of what type of music I’m playing. See, I went to school to learn how to play well. Where, a lot of the drummers that you see out here, they just pick it up and don’t really know what they doing. So I’m able to adjust myself and play in all types of bands and music. Because not only do I play it, I can read it. And that’s where my musical experience is a lot different from the average blues drummer. Because they don’t have any musical background. And I came in with the background of reading and writing and really understanding, into a blues type of music that didn’t really have any form to it. And by me coming in in the ’50s, I had to — where they use to play 3 bars or 6 bars, I came in and stretched the 3 bars to 4 bars. And where they played 6 [bars] I made it 8. And I adjusted the music from the 1950’s up to today, you see. The blues players [today], they play in phrases, but they play in 8 bar and 12 bar phrases. Where, at the time when I came in, they were playing haphazard type of phrases. There was no form. And the only way you would know what they were doing is by listening and learning the tunes. SKF: Do you remember what set you used in the studio? Were you playing on the same set in all those sessions? FB: No. I played WFL, and then I played Slingerland, and then Gretsch, and then later on, when I first went to Europe, I played on a Sonor set. And that was in 1965. The people from the Sonor Company contacted me and asked me how did I like their drums and everything. And I said, well, that I liked them very much. And so, when I came back to the United States they were presented to me. And they made me a Sonor drummer. I went to Europe and played all over the United States. And I went to Africa in different places. I had the Sonor drums with me. They’re very good. I still have them. SKF: How many mic’s did they use to record your drums in the ’50s? FB: Well, let’s see. They use to put on on the bass [drum], one on the sock cymbal, and then one in between the sock and the ride cymbal on the right. So, they was using just three microphones. SKF: That was the sessions with Muddy and Little Walter that they’d have that many microphones on your drums? FB: Most all the blues sessions are set up that way. Jazz set ups are a lot different. SKF: But they wouldn’t mess with your drums as far as muffling them, sticking pillows in them, and stuff like that? FB: Oh, yes. Like on a blues session we would take the front head of the [bass] drum off and muffle the inside. SKF: That didn’t drive you crazy? FB: No, no. You get used to it. SKF: You don’t play like that live with the blues bands though, do you? FB: No. I don’t play live like that with any band. I don’t take no heads off no drums. I’ve never understood the reason why. If a drummer has a foot, and you have a control of your foot, and you can tune your drums — you can tune your drums down to whatever sound that you like. But this is control. If you don’t have no control, then you don’t really know what you’re doing. That’s why I’ve never understood what this electrified drum outfit was about. It’s not really for a drummer. It’s just merely for a certain type of music or sound — and that’s it. SKF: So do you get a chance to get out of Chicago much? FB: I go anywhere where the job is presented. SKF: And do you take the same band with you? FB: Well, it depends. I have a group of musicians that I’m able to get in touch with whenever the job is. But since I’ve had, you know, I’ve had a couple of operations on my eye. I had a cataract surgery on both eyes. SKF: Oh! How are you doing? FB: I’m all through with that. I had a couple of jobs with my band. But mostly what has been coming in now is singles. Where they feature me on the different shows and things like that. In fact, I have a show tomorrow at the Chicago University. A blues session. That’s [Little] Willie Anderson. He’s a harmonica player from Chicago, which I recently made some recordings with. This entry was posted in Backgrounder Interviews, SKF Blog and tagged Chess, David Myers, Fred Below, History of Rock Drumming, Little Walter, Louis Myers, Modern Drummer, The Aces. Bookmark the permalink.